Thanks to everyone who read and commented on my interview with Kelly Fiore last week. I hope that those of you who didn’t win will check out TASTE TEST anyway! Next Friday will be quiet around here for Thanksgiving, but I’ll be back the week after with more Foodie Kidlit Friday goodness. See you then! 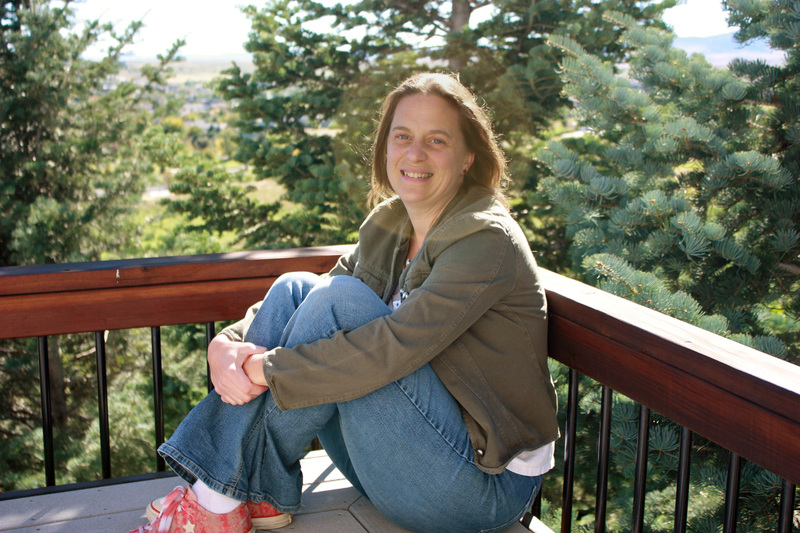 Interview with Colorado Author Suzanne Nieman Brown! Welcome back to the Colorado is for Writers interview series! Every other Tuesday, I talk to different Colorado-based authors about their work and their connections to this beautiful state. 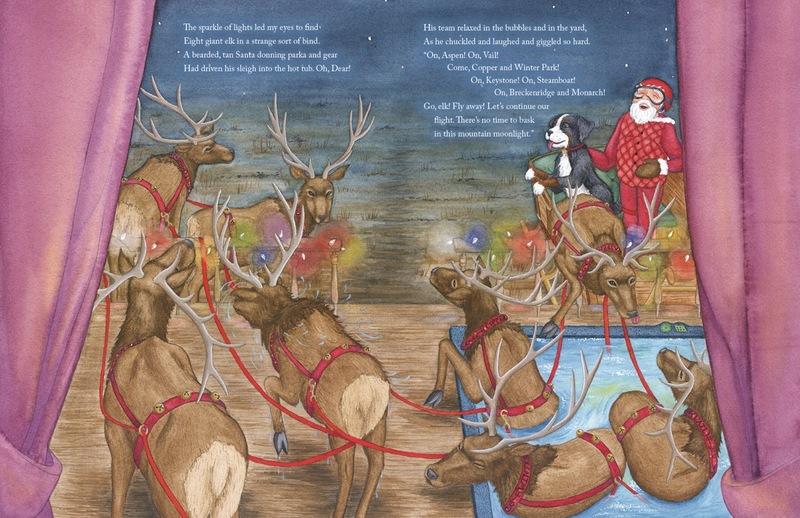 Today, I’m happy to welcome debut picture-book author Suzanne Nieman Brown to the blog! Transplant. My boyfriend and I road tripped up here to ski and snowboard with friends way back in the early 90’s. (Wasn’t that just a few years ago…?!) That boy and I married, realized our hearts belonged to the mountains, and moved here as fast as our careers would allow. We left once for grad school but returned a few years later. That was 14 years ago! Since then, we welcomed our daughter and son, adopted many animals to join our family, and turned native. *WINK* Even though I’ve lived in six states and explored 17 countries, Colorado is my home. My treasure always waiting for my return. 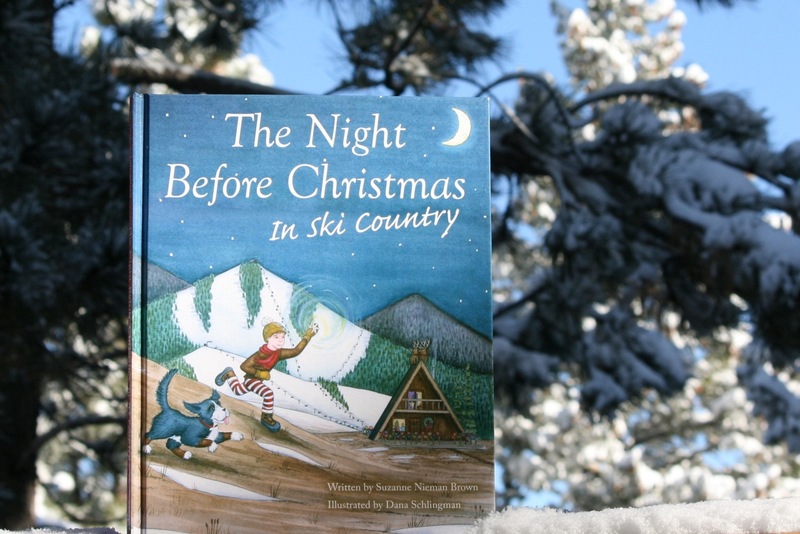 My first book, THE NIGHT BEFORE CHRISTMAS IN SKI COUNTRY, was just released! *YAY! * I wrote a version of this story when our daughter was born. I wanted her to have a Christmas book that reflected where we lived. 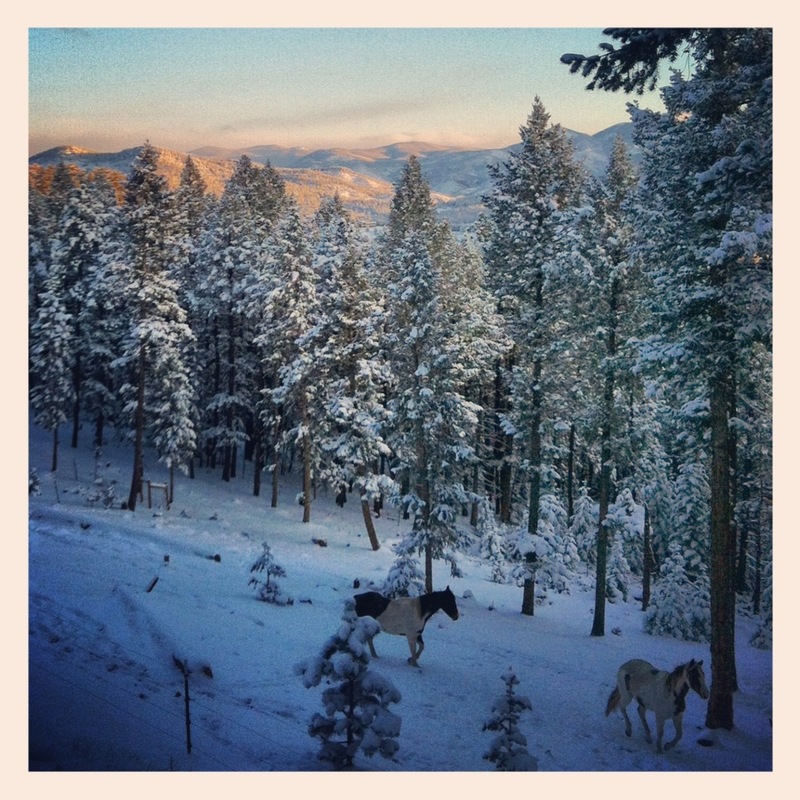 With snow and elk and a Santa that loves to ride! Every Christmas our family read it. Every Christmas my son asked when I was getting it published. And every Christmas I tweaked it just a little bit more. 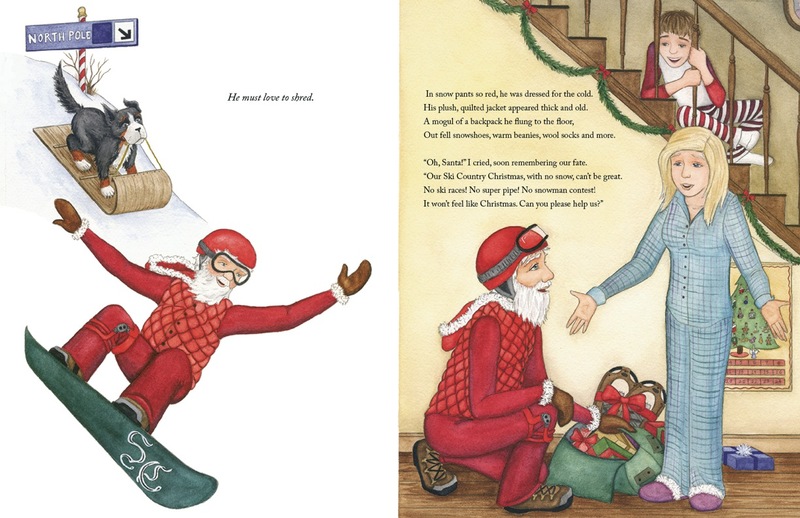 Last summer, I was talking to a publisher about another project when she mentioned they were looking for a Christmas book. I sent mine to her. She loved it and wanted it! And then I had a wonderful opportunity. My publisher asked me to find my own illustrator! 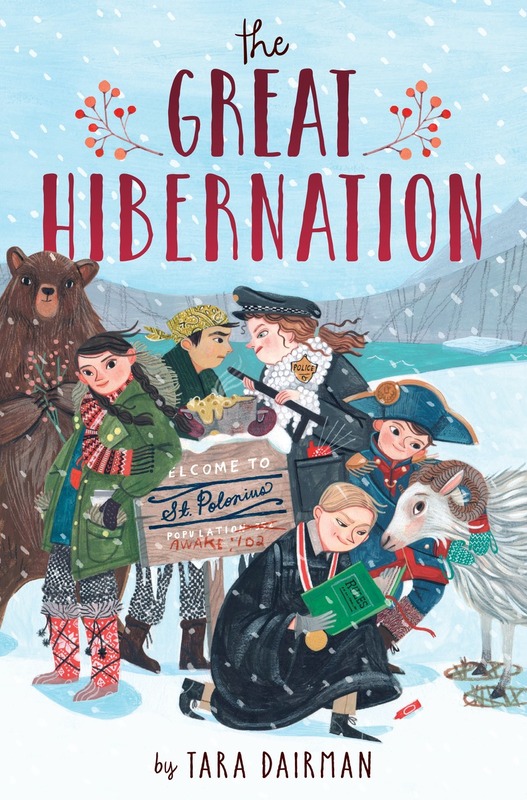 I found Dana Schlingman through SCBWI. She and I worked closely together on every page to make my words and her watercolor pictures (by HAND, not digital!) blend seamlessly into a beautifully illustrated storybook. I am also working on a middle grade novel that ties in with my other job as a Registered Dietitian/Nutritionist. More to come soon! In two words? Nature. Animals. In many words? Fluffy horses snoozing in the warm sun. Ribbons of mountains: dark green in the summer, speckled gold in the fall, and icy white in the winter. Our sweet dog, Lulu, upside down and fast asleep under my feet or zealously barking at the wild elk, turkeys, coyotes, deer, and bears that wander through our property. Smiling photos of my hubbie and kids on our many adventures. And my cold mug of minty green tea. The views! The seasons! The animals! I can’t pick just one thing. *SMILE* If I’m stuck in my writing, I take Lulu for a hike. In the quiet forest or stark mountaintops, my mind opens wide and the ideas flow. Suzanne, congratulations on your debut, and thank you so much for sharing a peak inside the book and a peak at your views (which, I must say are spectacular)! Good luck with your middle grade project! Welcome to the first post in my brand new new blog series, Foodie Kidlit Friday! 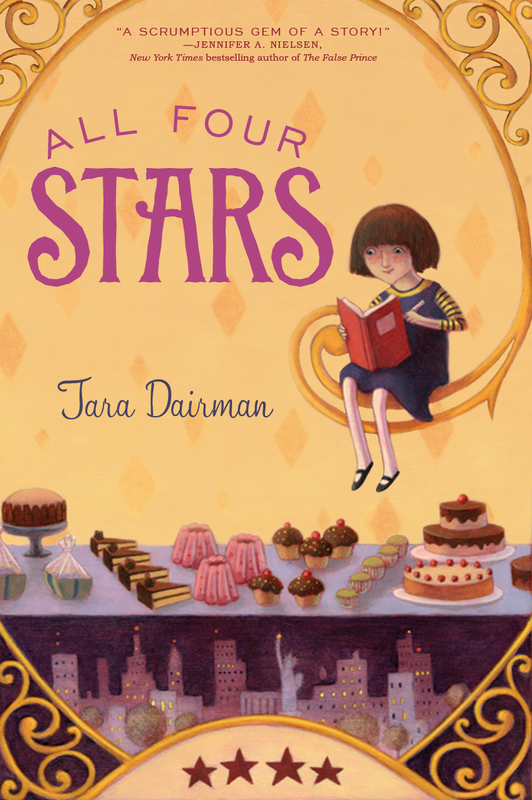 Every other Friday, I’ll be talking to authors of great food- and cooking-themed books for kids and teens, giving books away, and sharing recipes from my own forthcoming foodie middle-grade novel, All Four Stars. Kelly not only agreed to answer my questions, but is also giving away a signed book and swag to one lucky commenter (details at the bottom of the post), so be sure to leave a note and enter! If you can grill it, smoke it, or fry it, Nora Henderson knows all about it. She’s been basting baby back ribs and pulling pork at her father’s barbeque joint since she was tall enough to reach the counter. When she’s accepted to Taste Test, a reality-television teen cooking competition, Nora can’t wait to leave her humble hometown behind, even if it means saying good-bye to her dad and her best friend, Billy. Once she’s on set, run-ins with her high-society roommate and the maddeningly handsome—not to mention talented—son of a famous chef, Christian Van Lorten, mean Nora must work even harder to prove herself. But as mysterious accidents plague the kitchen arena, protecting her heart from one annoyingly charming fellow contestant in particular becomes the least of her concerns. Someone is conducting real-life eliminations, and if Nora doesn’t figure out who, she could be next to get chopped for good. 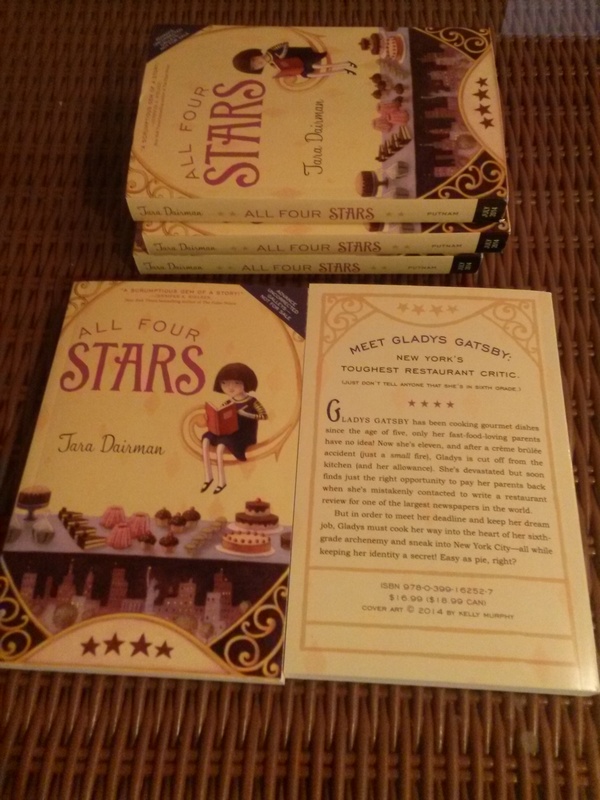 Tara Dairman: Welcome to Foodie Kidlit Friday, Kelly! TD: Let’s jump in with some food talk right away. Your main character in Taste Test, Nora, is a serious cook—though her taste is more down-home barbecue than haute cuisine. Does that reflect your own culinary background, or was it more of a conscious choice you made specific to Nora’s character? KF: It’s a little bit of both, I think. I’m from Maryland, where we’re know more for our blue crab feasts than barbecue, but I grew up next to the grill while my dad cooked his famous pork ribs. Like Nora says in the book, barbecue has its own language and I feel closest to the North Carolina style, with an emphasis on pork. When I wrote Nora, I wanted to write her as a spunky, present-day Joey Potter (from Dawson’s Creek): a not-so-rich, not-so-uppity smartass who could hold her own next to tough competitors. I wanted her to be an expert in something that wasn’t considered “fancy” so that she could prove that the art of cooking isn’t just about ingredients – it’s about technique and flavor, too. TD: One of the (many, many) things I loved about Taste Test was how each dish cooked by a teen contestant on the show reflected his or her personality. What was your method for coming up with the right choice for each character? Did you have to make lists and charts, or were you able to come up with the right food-fits on the fly? KF: I think the food writing was, by far, the most difficult part – I worried a lot about things feeling authentic. It’s surprisingly (or not surprisingly?) hard to write that momentum of a food competition – the vigor and energy, along with the cooking itself. I’m glad you feel like the food reflects the contestants because I tried to make sure each contestant, especially Nora and Christian, was cooking food that they had experience with in their “everyday” life. I actually have a back log of recipes I didn’t use for the book because they really didn’t have a place in the final manuscript. In terms of method, this is where I checked out the cooking competition Top Chef for ideas on themes and ingredients chefs gravitated toward. But, because this is a book for teens and I wanted teens to actually cook the recipes at the end of the book, I tried to pick things that would cater to their tastes as well. TD: Taste Test is your debut novel, but you have more books on the way. Will they feature foodie themes, too, or go off in a different direction? Unfortunately, no food 😦 But I have two books coming out over the next year and a half or so. Just Like the Movies is my sophomore novel, again from Bloomsbury USA. It’s about two girls – a bubbly-but-insecure track star and a quiet-but-sarcastic wallflower – who have nothing in common except an appreciation for great movies and the desire to have a perfect, Hollywood love story. When they meet by chance at a screening of Titanic, they formulate a plan to help spring their love lives into action – by using movie strategies made famous on screen. This book has everything – flash mobs, makeovers, meet-cutes, and, of course, the infamous John Cusack/Boombox scene – but this time, it’s using an iPod and speakers. 🙂 Just Like the Movies comes out in July of next year. In contrast, my first novel with HarperTeen, The People Vs. Cecelia Price, is a far darker, more gritty subject. It’s still YA, but it focuses on the inner workings of a family that is struggling with addiction, and the aftermath of an unexpected death. The main character, Cecelia, is in custody for the murder of her brother, Cyrus. As we get to know CeCe, we find out how incredibly damaged and volatile her life had become – and how she had to shift from part time student to part time drug dealer in the blink of an eye. The People vs. Cecelia Price is scheduled to release in Winter 2015. TD: These sound so different and intriguing, Kelly–congratulations on your success in writing and selling such a variety of books! Last question: It’s Friday night. Are you at home trying a new recipe, or out on the town, trying an exciting new restaurant? Since Book Club was last night and I had a delicious night out with some girlfriends, tonight I’m staying in. I think I’m going to make a spicy marinara with pasta for dinner tonight. I canned a heap of tomatoes over the summer, but I have a feeling they won’t last through to next year. Being married into an Italian family means Sunday Sauce (or Sunday Gravy, as some Italians call it) almost every weekend. Thank you so much, Kelly! Happy writing (and eating)! 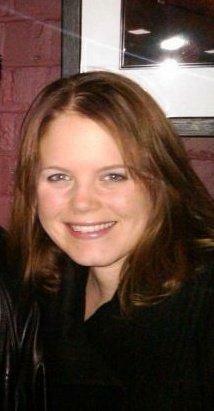 Kelly Fiore has a BA in English from Salisbury University and an MFA in Poetry from West Virginia University. She received an Individual Artist Award from the Mid Atlantic Arts Council in both 2005 and 2009. Her debut young adult novel, Taste Test, is available now from Bloomsbury USA. Her forthcoming titles include Just Like the Movies (July 2014, Bloomsbury USA) and The People Vs. Cecelia Price (Winter 2015, HarperTeen). She lives in Maryland with her husband, son, and two very feisty cats. You can earn one entry by leaving a comment here, and up to two extra entries by posting about this interview on Twitter and/or Facebook! Please include a link to your tweet or FB status in your comment to qualify for the extra entries. Thanks again for reading and entering! Good luck! Links, a giveaway, preorders, ARCs, and a new interview series! Whew! I guess the title says it all. Dear blog readers, it seems that I have quite a few things to catch you up on! Let’s jump right in. 2) A giveaway of Fair Coin by E.C. Myers! The winner will be announced next Monday, November 18, so please leave your comment this week if you’d like to enter. You will have your choice of a hardcover, e-book, or the brand-spanking-new audiobook of this fabulous, Andre Norton Award-winning novel if you win! That’s right–All Four Stars is now available for preorder! The sites where you can order it are all linked on this website’s Books page. I’ll make additional links active as it becomes available from more booksellers. The book releases officially on July 10, 2014. Exciting! 4) Even more exciting than seeing my book for sale online has been holding the advance reading copies (also known as ARCs, or bound galleys) in my hands! They arrived on my doorstep in October, and they are gorgeous. All but one are already out there circulating among early readers, but I hope to get a few back and be able to do a giveaway or two at some point. Stay tuned! 5) And last, but not least, I will be kicking off a brand-new blog series right here two days! 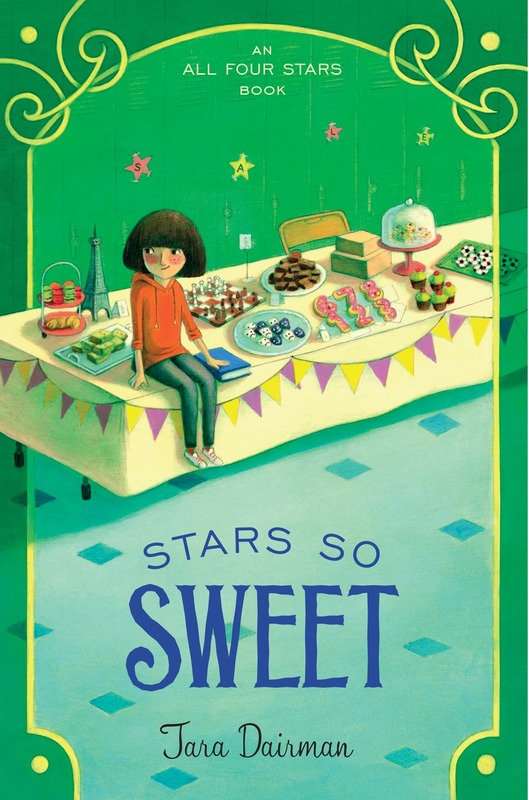 It’s called “Foodie Kidlit Friday,” and will focus on awesome books for kids and young adults (and, let’s face it, us adults who love kidlit!) that feature food and cooking themes. I’ll be getting things started with an interview of Kelly Fiore, whose debut YA novel Taste Test (set at a reality cooking show for teens) released recently and knocked my socks off. And one lucky commenter will win a signed copy from Kelly! I’ll be aiming to do this series every other Friday (on weeks alternating with the Colorado is for Writers series, which posts every other Tuesday). And in addition to interviews, I’m also planning to start sharing recipes for dishes featured in All Four Stars! So, this should be a very fun series indeed. That’s all I’ve got for now, but pop back by on Friday for the Taste Test extravaganza. Thanks! 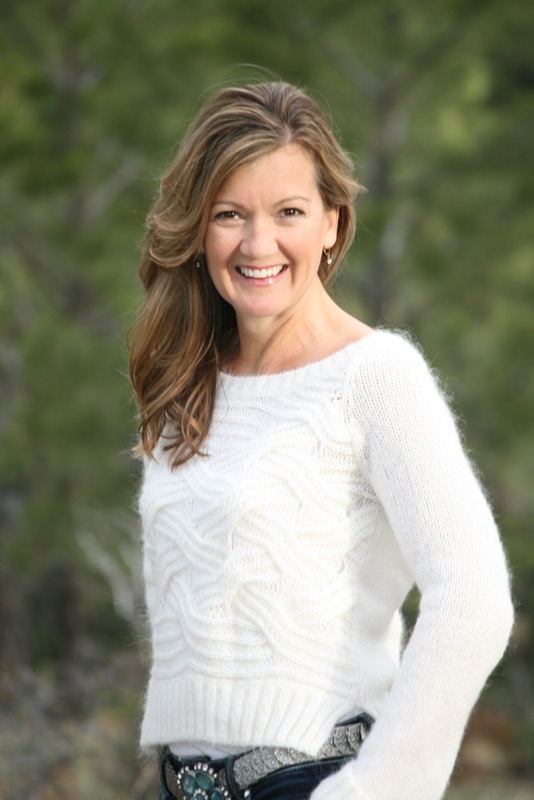 Interview with Colorado Author Maryanne Fantalis! Welcome back to the Colorado is for Writers interview series! Every other Tuesday, I talk to different Colorado-based authors about their work and their connections to this beautiful state. Today, I am thrilled to welcome my friend, writing-date buddy, and fellow ex-East-Coaster Maryanne Fantalis! Tell us a bit about your book(s), published and/or in progress! Right now, I’m querying a book called Finding Kate, which is a historical fiction based on William Shakespeare’s play The Taming of the Shrew. I also write young adult fiction. To support this habit, I do freelance writing and teach creative writing to middle school and high school students. What’s the view like from your favorite writing space? Although I have a room in our walk-out basement that’s supposed to be my office, it’s also the work-out room, a part-time guest room, and the general dumping space for stuff no one knows where else to put. I love the color of the room, and the stuff on the walls and the desk all have meaning to me, but I can’t work in a messy, multi-purpose space like that, so I do most of my work in the dining room upstairs. It doesn’t have my personal stuff, but it does have a great view from the windows. 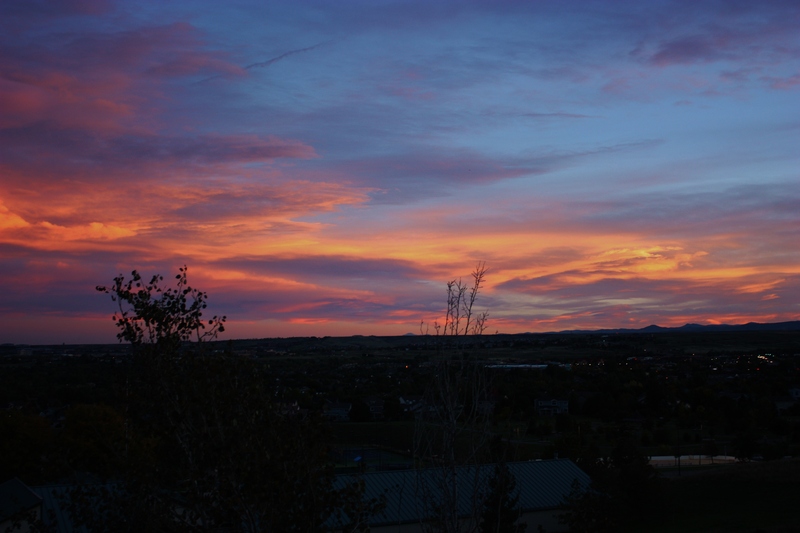 This is a recent sunset, with the foothills of the Rocky Mountains off the west (right) and Pike’s Peak a solitary lump in the center of the photo (100 miles away). 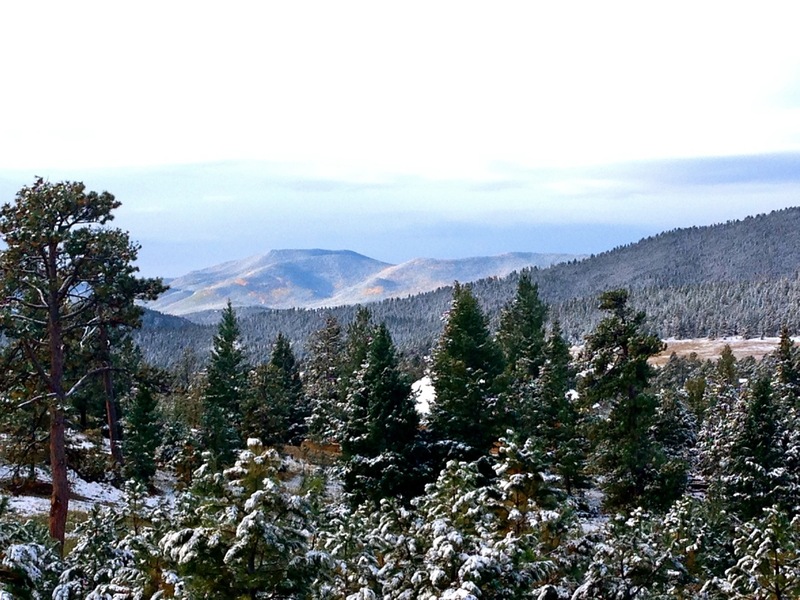 What’s the best thing about being a writer in Colorado? The other writers! I have met such great writers since moving here, people with great talent, skill and drive. Most of them have recently become published which gives me hope. I am humbled and honored to be included in their supportive, lively community. Thank you so much, Maryanne–I’m honored to be part of this writing community, too. And I also miss the bagels and pizza from the east coast (though Moe’s out here isn’t too bad!). Good luck querying Finding Kate! Fellow transplants (to Colorado, or elsewhere): What do you miss most about your hometown? Feel free to share in the comments!